Tuition fees are posted on the web site of the Vice-President and Provost in April for the upcoming academic session. In addition to tuition fees, students are required to pay incidental fees. These include campus fees and student society fees. Incidental fees are not included in the academic program fee posted on the University web site. International students must also pay for the University Health Insurance Plan (UHIP). 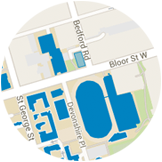 Further information regarding fees at the University of Toronto can be found at http://www.fees.utoronto.ca. Academic session fees cover enrolment in courses from September through August if the student is registered in each session while completing coursework required for the degree. Fees in graduate programs are not charged by course. Domestic fees apply to Canadian citizens, permanent residents and exempt international students. International fees apply to non-exempt international students. It includes the University Health Insurance Plan premium. All international students must have health insurance coverage, which they are required to obtain through the UHIP. For programs that are offered on a part-time basis, the part-time fee is calculated each September at approximately 30% of the full-time program degree fee until program requirements are completed. Only students admitted as part-time students may pay part-time fees. Note that the length of the program into which a student is admitted predetermines the minimum total academic fee that a student must pay prior to graduation. Many part-time students must pay a balance of degree fee prior to graduation. A balance of degree fee is charged most commonly to part-time students who take a heavy course load during the fall and winter and/or take courses in the summer session and complete requirements in less than 3 years. No part-time degree student may pay less than the equivalent of the full-time degree fee. Fees are not paid directly to the University. The fees invoice is available on ACORN as of mid-July. The account number is listed on the upper right-hand corner of the fees invoice. The minimum payment is listed on the fees invoice. Students must register by the SGS registration deadline which is typically mid-September. After this date a late registration fee will be assessed. The student takes the fees invoice printout to his/her bank to pay fees in person or the student can set up fees as an online bill payment with the student’s bank. New for the 2016-17 academic session, it will be possible to make ACORN online credit card payments for a convenience fee. For information about the new online payment option visit http://www.fees.utoronto.ca/credit_card_payments_faq_acorn.htm. MSW students receiving a major award that will cover tuition fees (i.e., OGS, SSHRC recipients) can defer fees as of July by submitting the School of Graduate Studies Fee Deferral form to the Factor-Inwentash Faculty of Social Work Registrar’s Office, Room 252. Students who have confirmation that they will be receiving OSAP (Ontario Student Assistance Program), may defer fees through ACORN as of mid-July. PhD students in Years 1-5 can defer fees on the basis of their funding commitment as of mid-July.